Kickstart a healthier, happier and fitter you with a Bali fitness and wellness retreat. Fit Food Relax Retreat is a luxury 7 Day/6 Night Fitness & Wellness Retreat, where you get to escape the hustle and bustle of life to focus on your health, fitness, and well-being. Imagine a week in tropical Bali, where you can participate in multiple fitness sessions daily, eat fresh, organic, nutrient-dense meals and juices, enjoy rejuvenating massages and naps by the pool, learn to surf, stand-up paddle board, cook healthy meals and explore hidden waterfalls. Imagine a week without traffic jams, meetings, deadlines, make-up, skinny jeans, tight-fitting suits, steel-capped boots or school drop-offs and what that could do for your health and well-being. Our Luxury Bali Retreats are facilitated by expert Australian trainers in a peaceful oasis where you can relax, reset and recharge! Oh hey there, thanks for your interest in our retreats, a real human will email you an e-brochure shortly. Set on the lush and unspoiled east-coast of Bali, you will be encapsulated by the views in and around the resort. Conveniently located only 45 minutes away from Bali's International Airport, far from the crowds, noise and pollution. 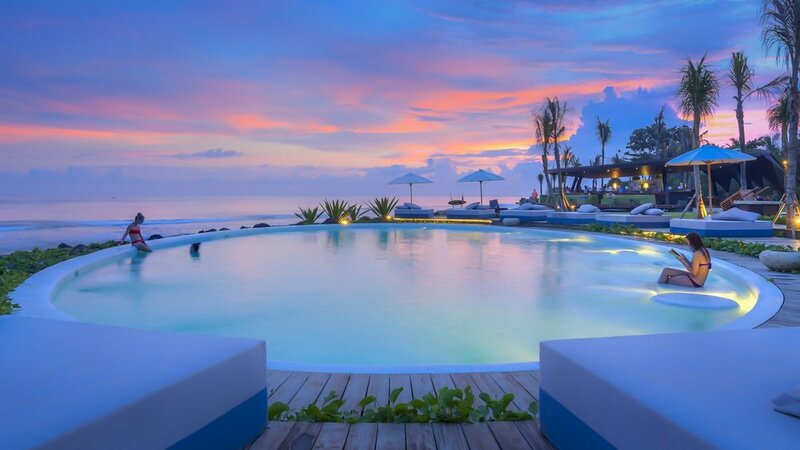 With its pristine black sand beach and world renown surfing spot, our 4-star beachfront Bali resort offers crisp and clean rooms, hypnotic views and fantastic facilities such as a beach front pool, yoga shala, fully equipped gym and relaxing day spa which offers a wide selection of exotic treatments. Each room features the choice of a queen bed or two singles, a private ensuite, high-speed Wi-Fi internet, satellite TV, couch and study desk, in-room safe, ceiling fan and air-conditioning, to take the edge off the Bali heat. Each day will consist of four active sessions from boxing on the beach, functional training workouts in the gym, core strengthening pilates and muscle easing yin yoga to the more leisurely stand-up paddle boarding, surfing & waterfall hikes. Delicious, healthy, organic, nutrient-dense meals, snacks and juices prepared by an executive chef, designed to fuel your body so that it can work at its optimum during your retreat stay. If you’re in need of some much needed 'me time' and want to escape the hustle and bustle of Bali and enjoy a healthy holiday experience with like-minded people, then you’ve found the right place. Six nights in a luxury 4-star beachfront resort. Airport transfer to the resort. All Meals - Breakfast, Lunch and Dinner a' la carte each day. One x 50-minute relaxation massage. Four training sessions each day. Transport and entrance fees on all excursions. A surf or stand-up paddle boarding lesson. A hands-on cooking and nutrition workshop. Expert Australian facilitators and trainers. Don’t take our word for it, read what some of our previous guests had to say.